CLPA Europe. It has been produced jointly by the CLPA and Profibus & PROFINET International (PI), following the announcement of a close cooperation between them to promote the further adoption of open industrial networks through the development of mutual interoperability. Open networks make it easier for industrial equipment from different manufacturers to communicate over the same control systems, so will be vital for achieving the high speed, high volume data transfer rates required for productive and efficient I4.0 and IIoT manufacturing. Presently there are many different communications protocols and standards, many of which are incompatible with one another. 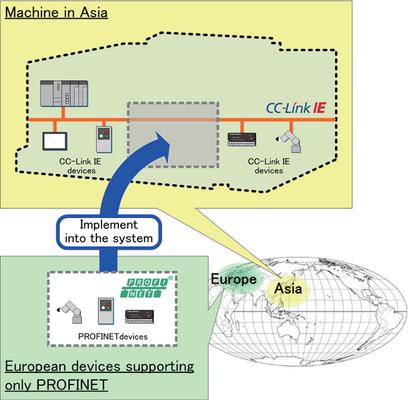 Through their cooperation, the CLPA and PI aim to enable transparent and easy bi-directional communication between CC-Link IE and PROFINET equipped machines, systems and devices through standardized interfaces.